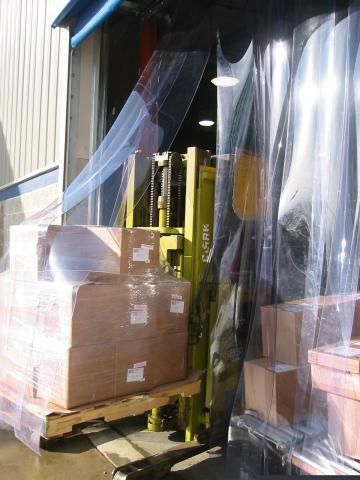 Let People & Industrial Equipment Through, While Blocking Dirt, Dust, Noise & Temperature with Goff’s Strip Door Curtains! Strip Door Curtains are the most economical solution for protecting employees and goods from adverse environmental conditions. A strip door, also called strip door curtain affords protection and controls noise and temperature while still allowing supervision and passage of light. Goff’s Enterprises, Inc. warrants all Strip Door Systems from failure in normal use due to defects in material or workmanship for a period of FIVE years from date of purchase. A LIFTETIME warranty on all mounting hardware. Goff’s Enterprises may elect to repair or replace defective or damaged goods. Mount the door flush to the wall or under the jam or suspend mount it with Goff’s Universal Mounting Bracket! 14 Gauge galvanizes steel construction, permanent ¼” studs, reinforcement plates and lock nuts are all included. Custom Sizes available in Standard, Ribbed, Weldview, or USDA Grade Strips.